Natural stone is like wood. There are hard stones and there are softer stones, just as there are hard woods and soft woods. As long as you select the right stone for the job and your lifestyle, caring for a stone floor does not have to be a chore. 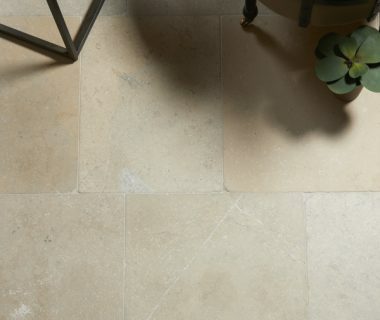 Here are a few simple steps to ensure your stone floor gleams for many years to come. Firstly, keep your floor as free as possible of loose dust and grit with regular vacuuming or sweeping. This will greatly reduce the ‘sandpaper’ effect of dirt getting compacted into the surface and joints. Then, we recommend washing the floor firstly, to remove the dirt that a vacuum won’t pick up, and secondly for hygiene. We strongly recommend that you use specialist cleaning products for stone. The harsh, acidic supermarket products will ‘bruise’ the stone and erode protective sealants. Ideally, use a product that is PH neutral, bio-degradable and environmentally-friendly. Using the correct specialist cleaning product will greatly reduce the frequency of more intensive cleans and even the re-seals that may be needed for the more porous types of stone. General wear of the surface from foot traffic over the years exposes capillaries within the stone. Over time these can accumulate dirt and grime. Therefore, we recommend a more intensive clean every 3-4 years, with a heavy-duty product that will dissolve ingrained dirt and grease. A common misconception is that every stone floor needs resealing every few years, but it is true for the more porous stone surfaces. You can normally tell if a stone does need resealing by wetting the stone and leaving for around 5 mins before wiping off and if the water leaves a mark by darkening the stone this will mean the stone is becoming more porous. If you do decide to reseal your stone, you should give it an intensive clean with a product that penetrates the surface prior to resealing with an impregnating sealer. You may, however, decide your floor doesn’t need resealing but could do with being refreshed. Applying a surface refreshing product every 4 – 6 weeks will help with this. Do not use any of the following products on your stone floor: bleach-based cleaners; washing-up liquids; strong de-greasing detergents; anything that contains natural acids or alkalis. Avoid non-specialised supermarket cleaning products. Avoid using steam cleaners – they may clean some surfaces, but the hot steam can remove the sealer and repeated use will ‘spall’ and damage the surface. Our Stone Essentials range covers all the bases for a cleaning and maintenance regime that will ensure your stone floor grows old gracefully. All Clean is the Stone Essentials product for your routine cleaning. It’s suitable to use on stone, it’s an antibacterial detergent and can be used weekly or even daily without detriment to the stone as long as you dilute it as per the instructions on the bottle. For a really deep clean, we recommend Stone Essentials Deep Clean, heavy-duty cleaner which uses a combination of effective solvents and cleaning agents to dissolve ingrained dirt, grease, heavy soiling and many other problematic stains. The less you dilute it, the stronger the solution – but you must carefully follow the instructions on the bottle. If you refresh your floor by applying a sheen with Stone Essentials Easy Sheen every 4-6 weeks, for example, you may find you do not need to completely re-seal stone.